Authorized BERNINA dealer since 1994. Quilts & Kreations offers on-site repair services by a qualified technician. Additionally, when you purchase a BERNINA machine from us, you will receive private owner lessons, FREE of charge. These classes, taught in a hands-on learning environment, will get you accquainted with your new BERNINA's wonderful sewing features. With your BERNINA purchase, you'll also receive a FREE lifetime BERNINA Club membership, designed to keep you learning--and enjoying--your sewing experience! 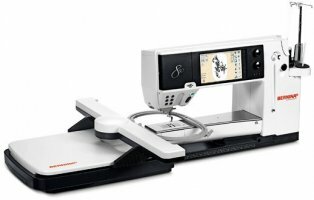 The BERNINA 830 is the only, luxury, high performance sewing and embroidery system in the world. When you create on the BERNINA 830, your grandest ideas can come to life. That's because it offers the most sewing and embroidery space, unbeatable speeds, and the most advanced ergonomics of any home sewing machine.